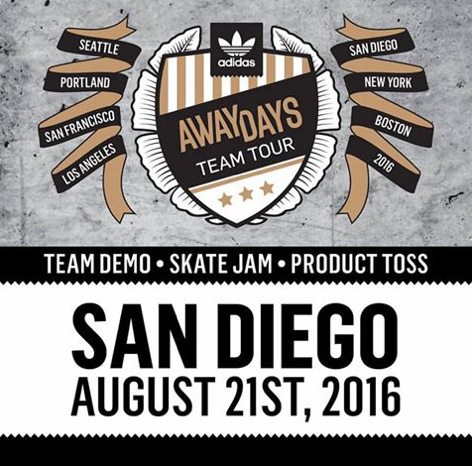 #AwayDaysTeamTour came to San Diego August 21st – well a little north they came to the Transworld HQ in Carlsbad. 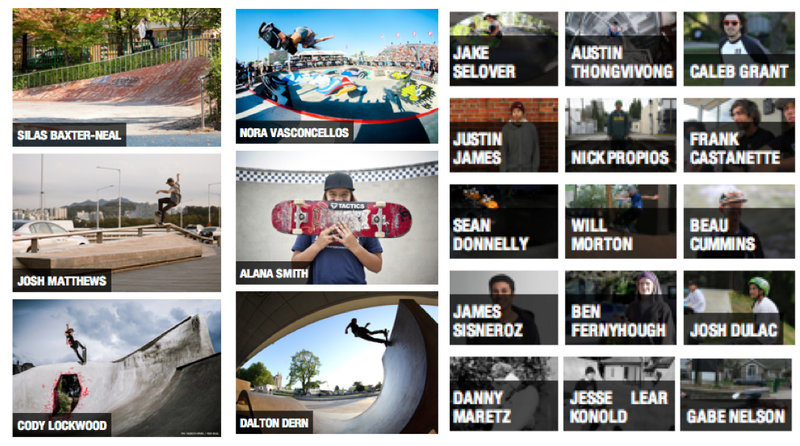 Click all the links & pictures to see tons of rad shots & videos. 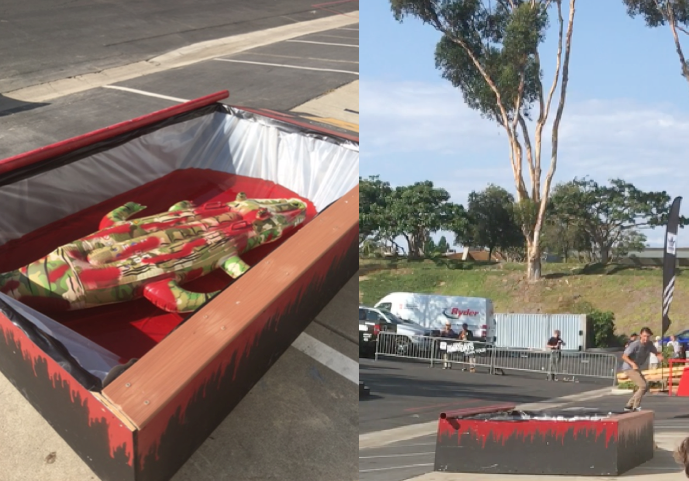 Custom obstacles were built by Surf Ride, Sun Diego Board Shops, Pacific Drive Skateboard Shop, Active Ride Shop, & Asylum Skate Shop with the adidas skateboarding team & TransWorldSkate staff. Huge thanks everyone that built the obstacles & to Cairo who did so much of the organizing and testing. and free shoes – well you had to work for the shoes – which Isaac from Asylum Skate Shop did – he won a years free supply of adidas shoes for this 100 foot rail slide! Till next time – the next stop for #AwayDaysTeamTour is east coast – keep it stylish on & off the board – and if you see me land a front shov it’s all thanks to enwhytj – he has a lot of patience. above moments with @pete_eldridge @miles_silvas @silasbaxterneal from the final West Coast demo of the #AwayDaysTeamTour. 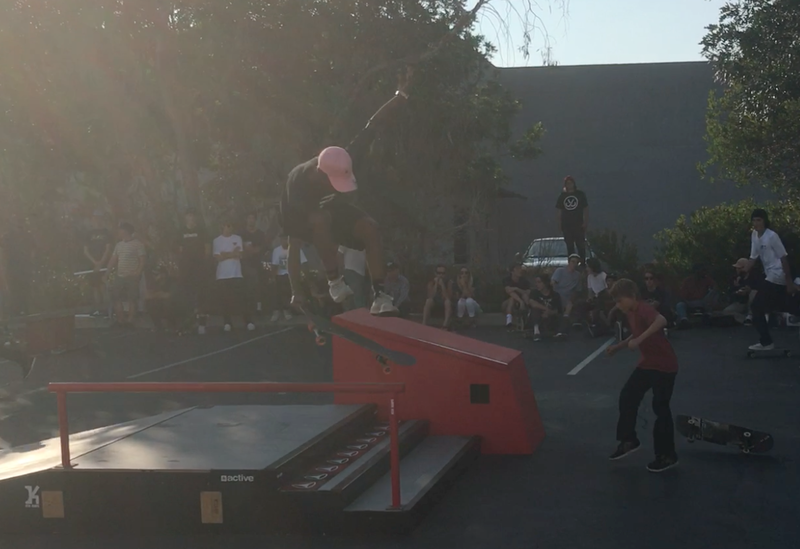 The San Diego stop showcased #bringyourbuild features from local skate shops for everyone to skate. 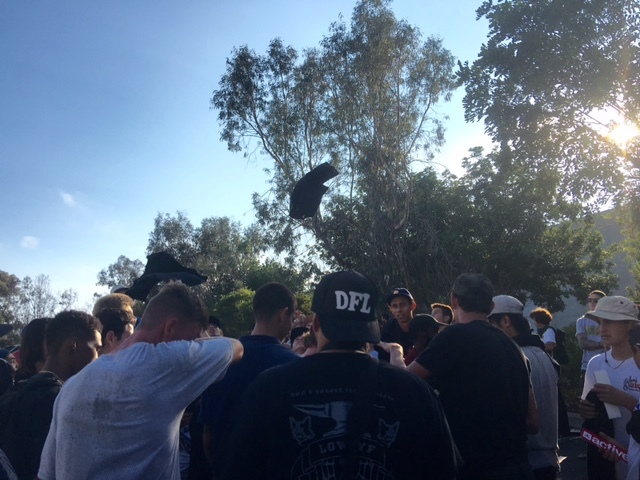 Full recap of the West Coast #AwayDaysTeamTour is live! 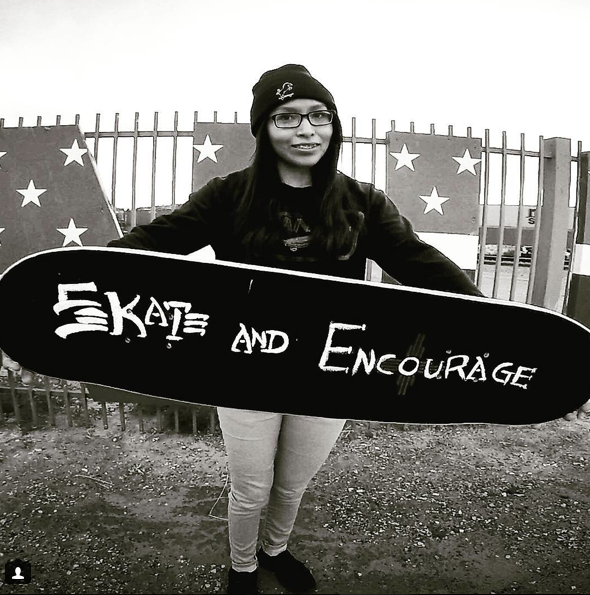 Back in June, I wrote about Cecely505 and her mission to fundraise for the Gallup, New Mexico Skate Park. 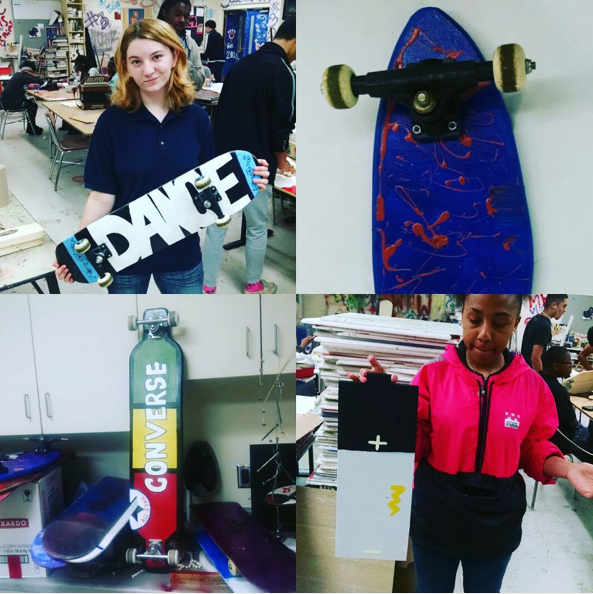 She’s been busy since the post so here’s just a few of the awesome things that are helping to make the skate park a reality. 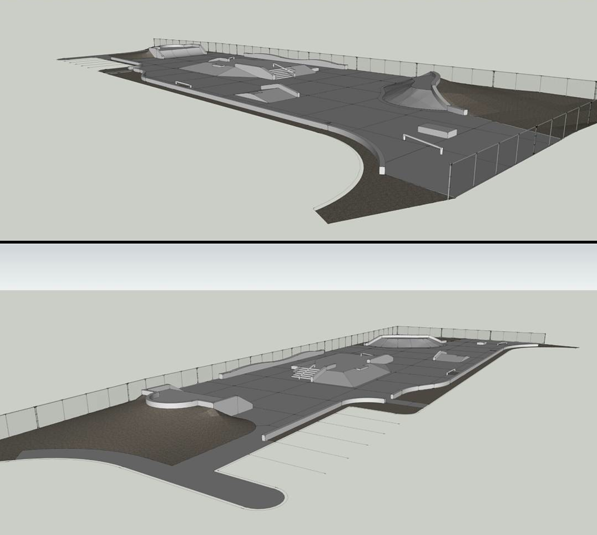 Drawings of what the new skatepark will look like. I’m big into “seeing is believing” so to me drawings are a huge step towards the park opening. And as of August 18th this is updated drawing. 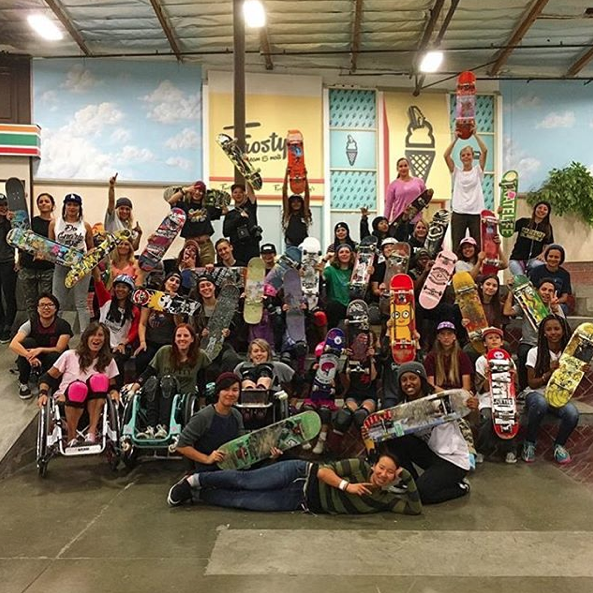 Artists have been creating and donating pieces for #gallupskateparkfundraising. Skate parks are expensive everyone’s donations (big & small) add up to build a park. Some boards were sold and the 3 above were raffled off. There’s been more coverage like Navajo Times above and by Too Pretty Brand below. The more people who know the more people that can help out. 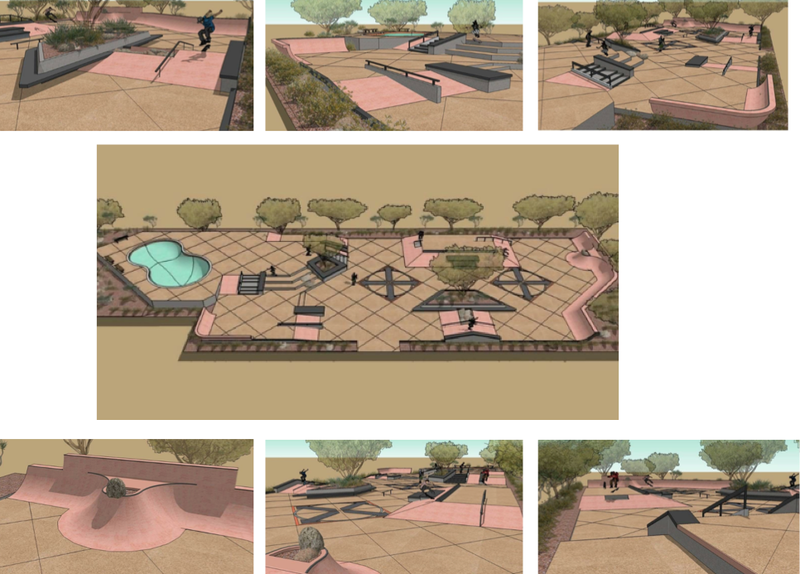 Thank you Tony Hawk Foundation for approving a grant for this park. In a remote reservation community forgotten by most of the world, the extreme conditions are everywhere apparent. 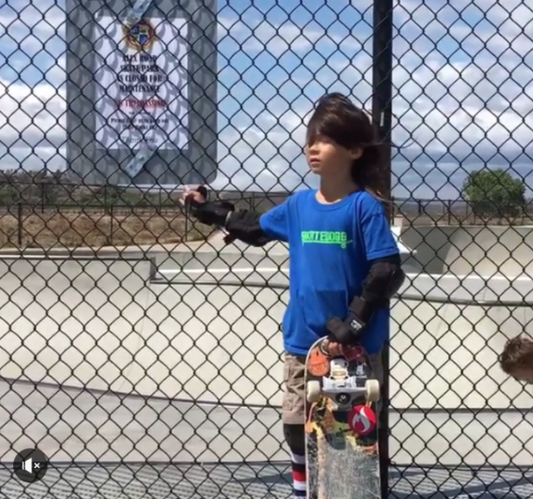 The inspiration for a decent and safe skate park has come from our young. In an environment filled with drugs, abuse, and domestic violence, the young Native Americans in our region are unable to be kids. 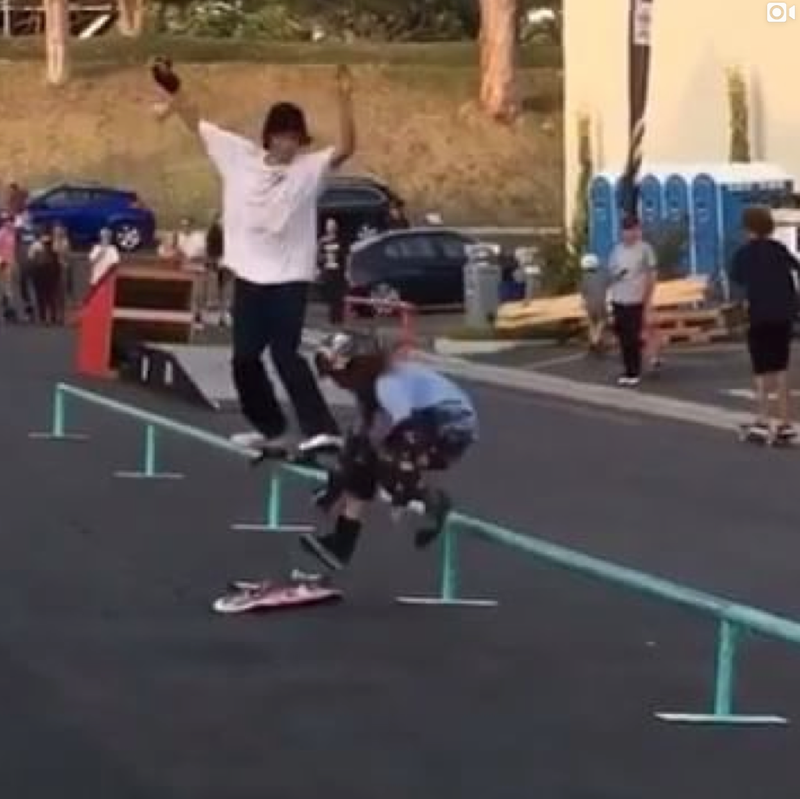 Many turn to skateboarding for an outlet and comradery. Unfortunately, due to the unforgiving terrain, the young skaters are forced to skate in unsafe locations such as dry washes and dilapidated parking lots. 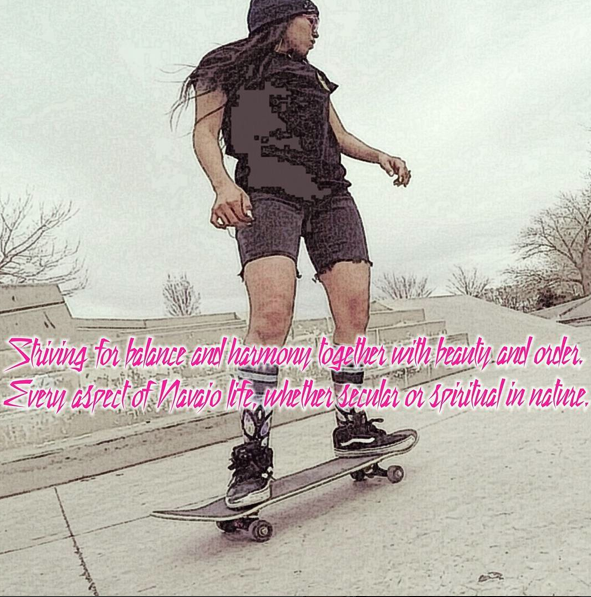 Skateboarders who live on the reservation may have no surface to skateboard at all and come to Gallup to skate in the same unsafe conditions. 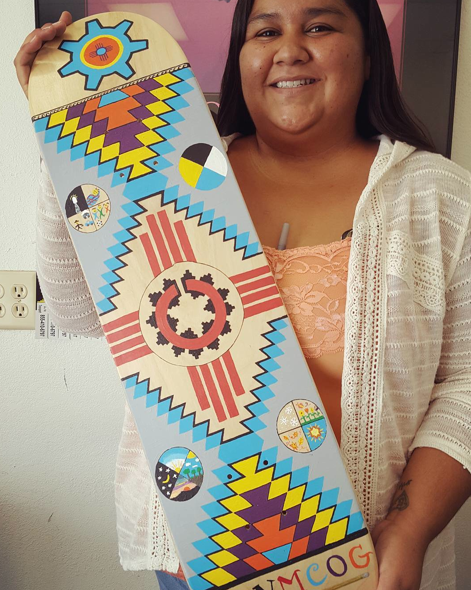 The Southwest Indian Foundation has partnered with Gallup locals and the Native American skateboarding community to build a safe quality skate park. This skate park will be used by local Native American skateboarders, as well as the countless skateboarders who live on the surrounding reservations and come to Gallup to skate. 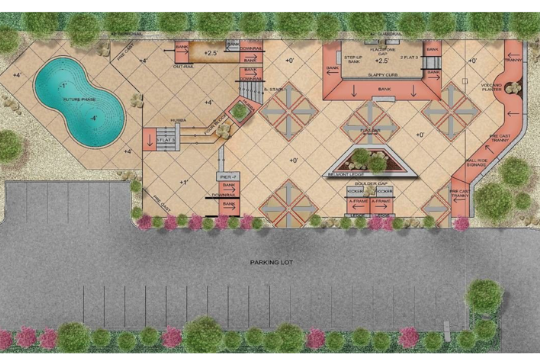 The plan is to break ground in Spring 2017 – for more information on how to help contact Cecely. 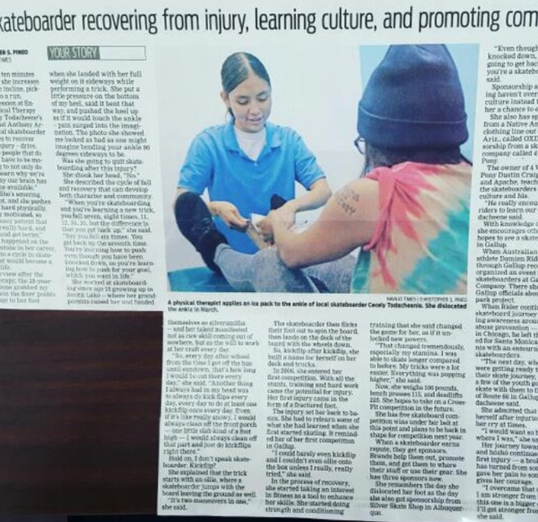 Skateboarding isn’t a Crime & stories like this show the good skateboarding does in communities. Everyone changes the world it’s up to the individual if it’s a big or small, positive or negative impact – wishing you all go big & positive this Monday & every day. 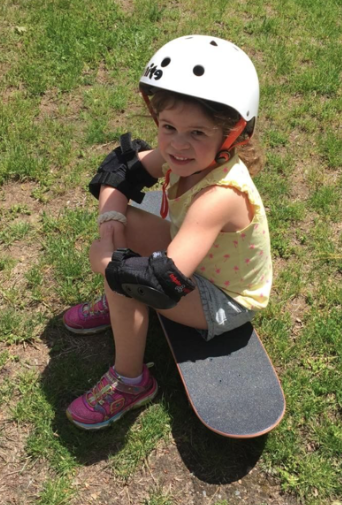 Wyoming the last state alphabetically but not the last state on our #girlscanskate USA. Above allisonmccuskey cruising in Jackson Hole. 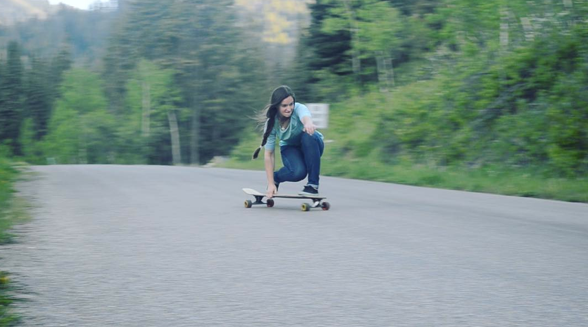 Wyoming is now on my list to skate – so beautiful. Many more posts on states to come – this is turning in to the funnest collage yet! 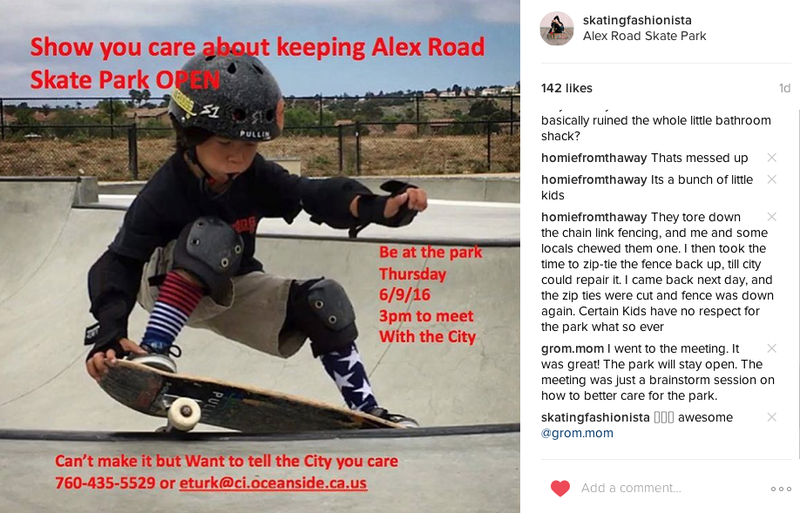 Alex Road Skate Park – Oceanside California – CLOSED ??? Yes that’s me a few years back with Anika & Klara at the ribbon cutting ceremony for Alex Road Skatepark in Oceanside California. While Alex Road Skate Park is not my “home” skatepark. I was sad when friends like Orion told me it was closed due to vandalism. So I could go cry about it, or maybe complain about it, or find out what’s next. I went with find out what’s next and contacted Eileen Turk Neighborhood Services Division Manager Parks & Recreation Division for Oceanside. Below are my questions – her answers & some important information on what you can do to keep this park open. SF: I’m bothered that anyone thinks it’s ok to take a spot used & enjoyed by many and just trash it. Is that what happened? What was the extent of the vandalism? ET: Our restroom was destroyed with graffiti and the toilet was ripped out. The Park is tired of painting over graffiti and now they had to order a new toilet. It was a terrible mess. I’m sorry Orion went and found the park closed – I truly want it to be open to everyone. SF: Is there or will there be a Watch Program like Neighbor Watch – the park is not staffed so what should someone do if they see “suspicious/bad” behavior? ET: I’m having a Community Meeting on Thursday June 9th at 3pm all are welcome. SF: Is the closing temporary? ET: Yes the park is reopened upon completion of repairs. SF: What are the next steps? What can people who want the park opened do to help? ET: They can call me at 760-435-5529 or email me at eturk@ci.oceanside.ca.us I know they want the park open – but they need to police it. Alex Road Skate Park cost $800,000 to build. We are so lucky to have it, we do need people to protect it. Thanks Eileen for your time & I hope lots of people do go on Thursday June 9th at 3pm to the park. 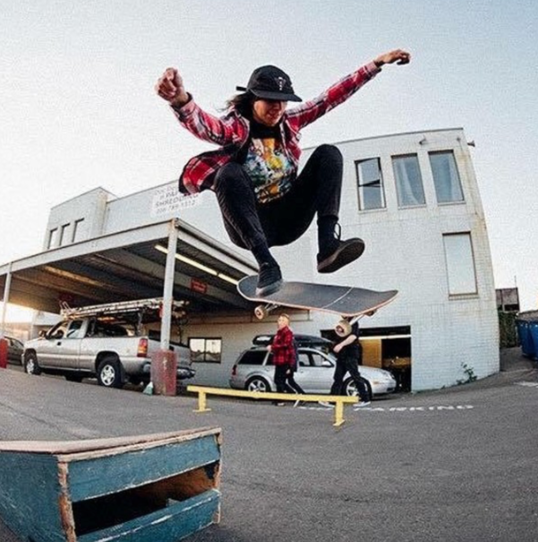 Bullies vandalized the park – it doesn’t matter why – what matters is the bullies are winning we are on a path to close the park and have another example where skateboarding is “bad”. Vandalism doesn’t just happen here, in LA Sheldon Park where Girls Skate LA was going to have their monthly meet up was also closed for vandalism. 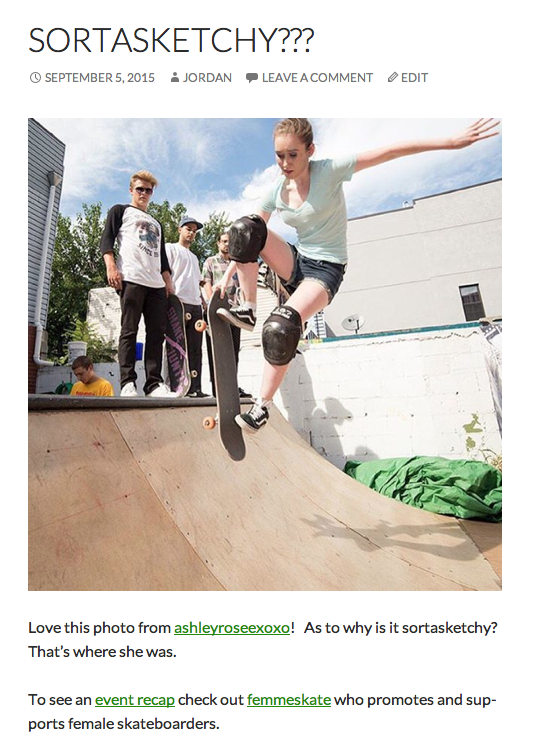 but is this what we want – to have to skate only at private facilities because we can’t protect public skate parks? That’s not what I want – I want more freedom to skate everywhere. 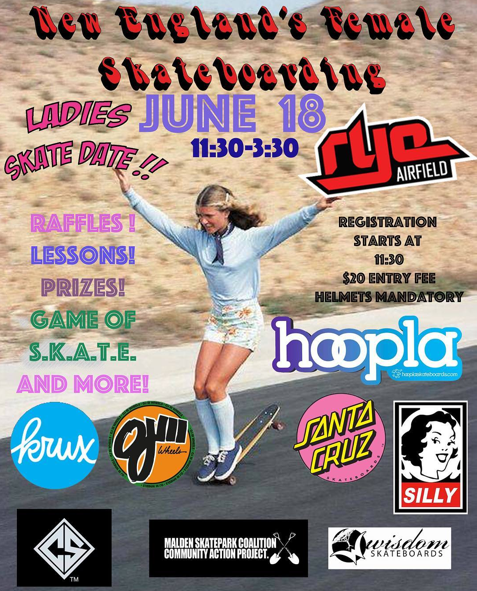 Looking forward to June 9th at Alex Road 3pm to find out who and how I report vandals to – if I see something I’m going to say something because every public skate park is my park. 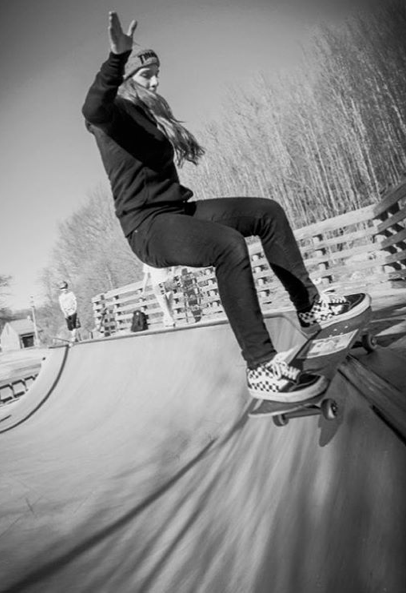 The latest collage #girlscanskate everywhere in the US is probably the most intense one. 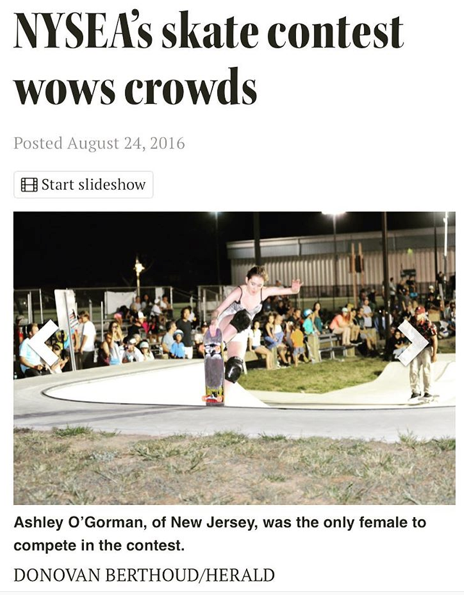 When I did the collages of girls skateboarding around the world and girls skating in Canada – it was open. However many girls from wherever. This time it’s 50 some girls – 1 from each state. There will be more than 50 because I have a girl skating in District of Columbia which is our countries capital and I’m hoping to get a picture from Puerto Rico and as geography is not my strength there’s probably other US territories. Day one I received this picture from Rhode Island from amyliterock105. 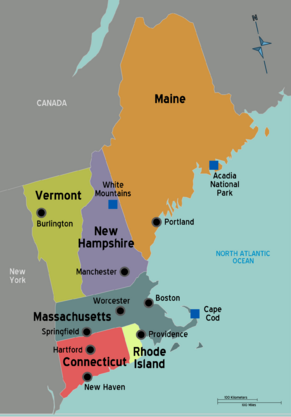 Right off I’m happy because Rhode Island was a state I didn’t have. Then I found out more about this picture. 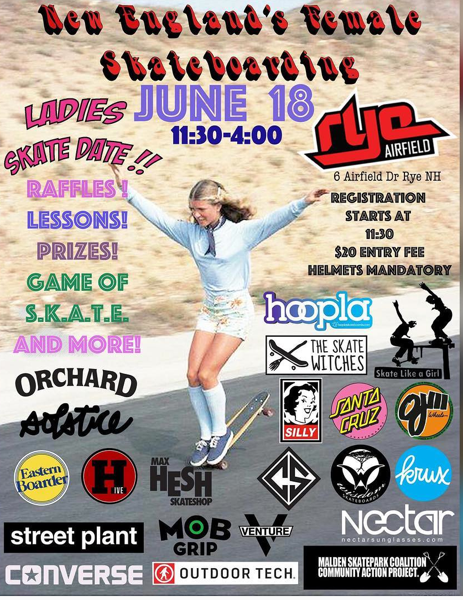 What’s @rollforrob Skate Camp? There isn’t a camp – the picture is Rob & his daughters. But, Roll for Rob is very real. I want to share what Roll for Rob is because I’m constantly impressed by how generous skateboarders are and how you’re a skateboarder for life not just when you’re riding your board. 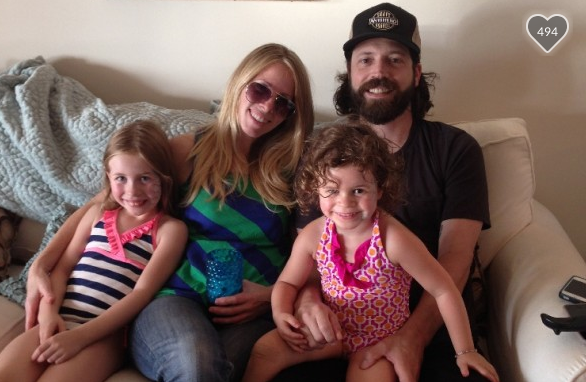 Rob Pontes is a loving husband and father of two young daughters, Avery and Oliva. On any given day he could be found skateboarding with his friends or putting on events for work. Other days would consist of 7am wakeup calls from the girls ready to run around outside to create beautiful family memories. Now, things are a little different. About two years ago Rob began feeling lethargic and developed other symptoms that doctors initially thought to be Lyme Disease… As these symptoms progressed Lyme Disease was ruled out, and doctors are now leaning towards the early stages of ALS. 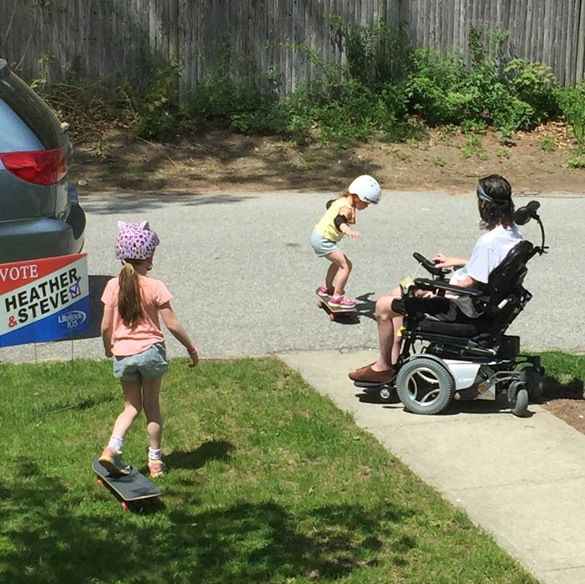 A once active guy, Rob now needs a wheel chair to get around on those family outings and the wheels on his skateboard have not rolled in two years. Simple chores around the house like laundry and dishes(yes he used to do them both! )can’t be done due to weakness throughout his entire body. Even kissing the girls goodnight before they go to sleep is physically draining. Yes there are lemons in skateboarding – ask Beyonce there are lemons everywhere and sometimes good people do lemony things. We all have a choice to make lemonade. I like to think I make lemonade by sharing inspiration. I certainly was inspired by this picture of Roll for Rob Skate Camp – Rob with his daughters Avery & Olivia. 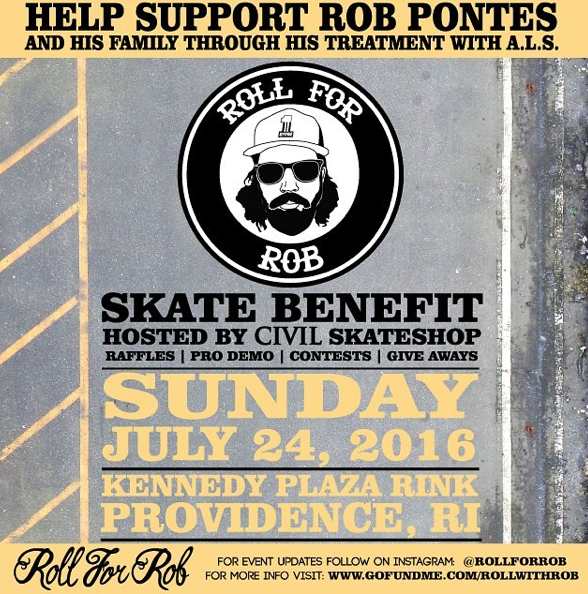 And if you’re in Rhode Island on Sunday July 24th check this out & please share pictures with the blog. 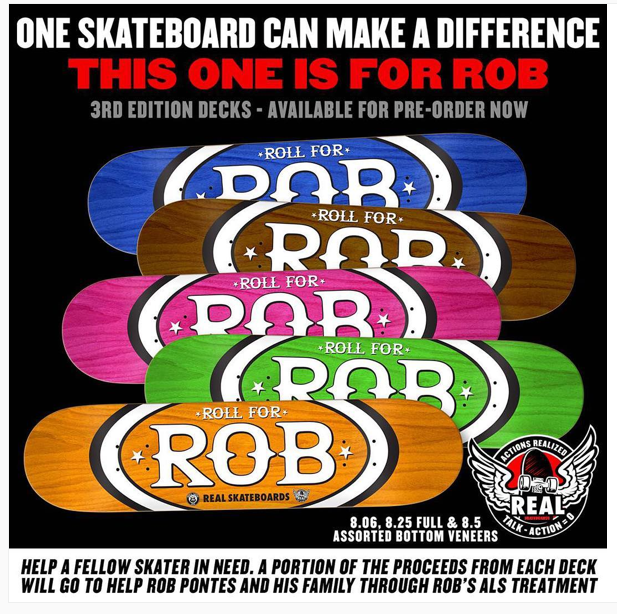 The new #rollforrob decks are available for pre-order. Please tag your local shop. Any shop looking to pre order the boards please contact brad@dlxsf.com. They will be for sale at the next event July 24th @civilprovidence and your local shop. 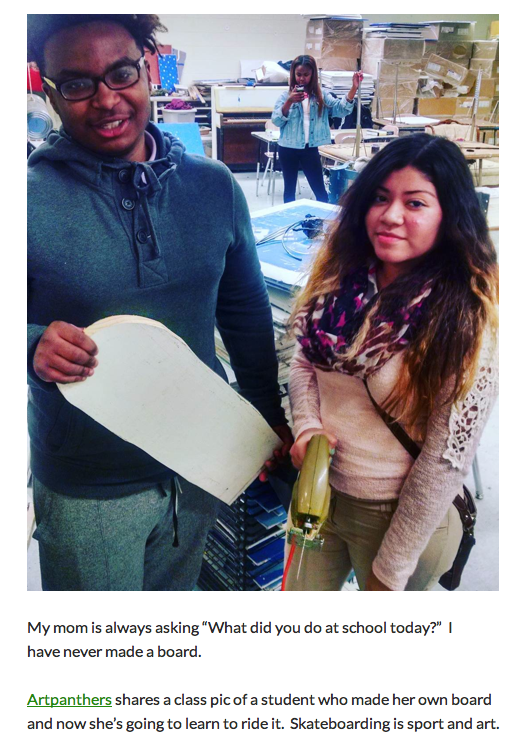 On January 25th I wrote about Artpanthers – how skateboards were being made in school. 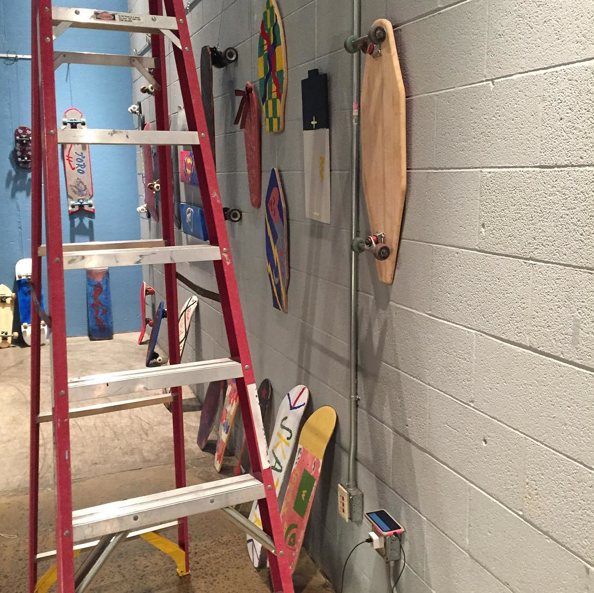 Here’s an update on where some of those skateboards went. They went on exhibit at Six Ave Nashville. In their coffee bar. Skateboarding is sport & art – show us how you keep it stylish on & off the board. 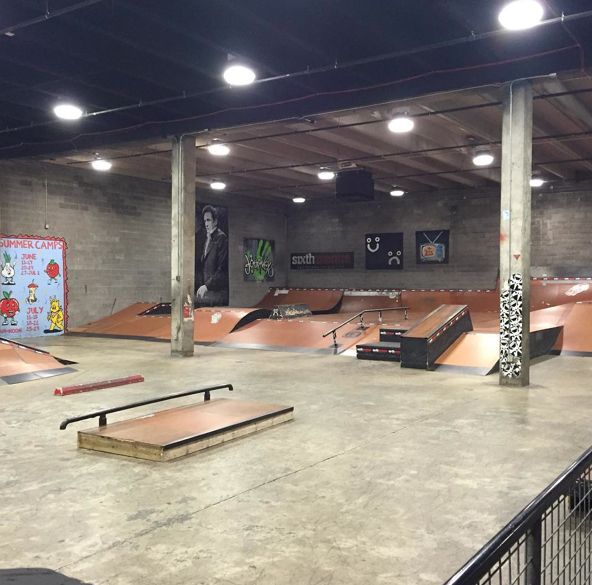 And if your skatepark has a coffee bar – that’s way stylish – be sure to share where it is!